The "Seventy-four" was a type of two-decked sailing ship of the line that from about 1770 to about 1830 was a mainstay of the world's fleets. The ship nominally carried 74 guns. 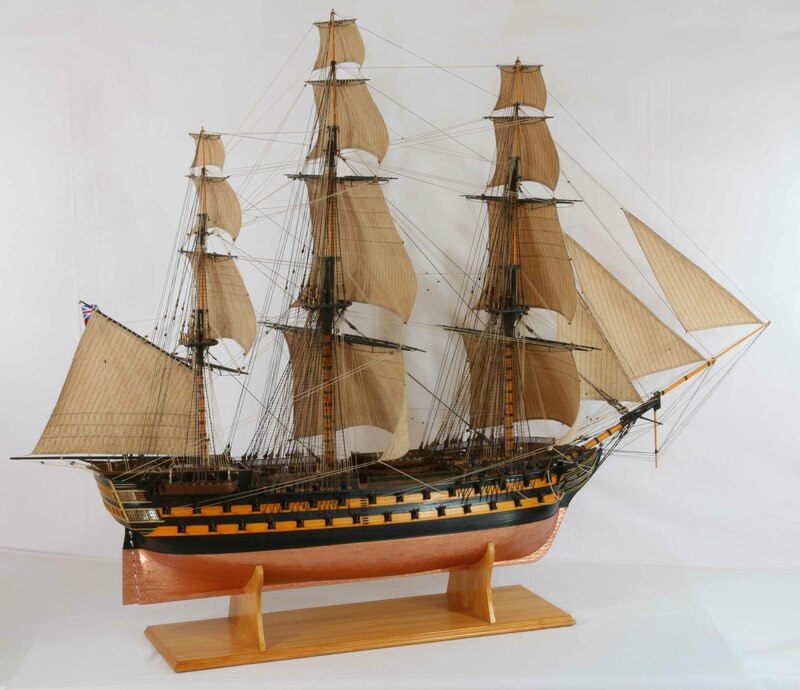 The type of ship was originally developed by the French Navy in the mid-18th century and later became a standard feature in all European navies. The design proved to be a good balance between firepower and sailing qualities. HMS Melville was one of the standard 74s, built in 1813 - 1817 and named after Henry Dundas Viscount Melville who had been First Lord of the Admiralty in 1804 - 1805. The ship belonged to the Black Prince class ship of the line, was ordered in 1813 and launched 1817 at the Naval Dockyard at Bombay. She served in North America and the West Indies, later on at Cape of Good Hope and in the East Indies and was present during the First Opium War with China. In 1857 she was converted to serve as a hospital ship. In 1873 she was sold out of the navy. The HMS Melville model was built to plans of Harold A. Underhill, scale 1 : 64. It took the modeller, Mr. Klaus Beining, 2500 work hours in 1993 - 2009 to make this ship model. All pieces except for the guns were made by himself. The copper-sheathing of the under-water hull has 2800 plates. All sails except for the studding sails are set. This model of an English 74 gun ship of the line is a true masterpiece, beautifully built with extreme care for details, especially in detailing the rigging and sails. When building the model documentary photos were taken (webpage with 119 pictures, size 7.3 MB) that have been compounded to a 100 page book. The book is sold with model. The ship model is 1 : 64 scale. Length is 145 cm, width 50 cm, height 108 cm. There are more photos, several views of the entire ship model taken from all directions, and several closer views of hull, deck and rigging. Click images to enlarge!